Oppo has recently launched the new selfie experts Oppo F3 and Oppo F3 Plus in Indian market that comes with dual front cameras. 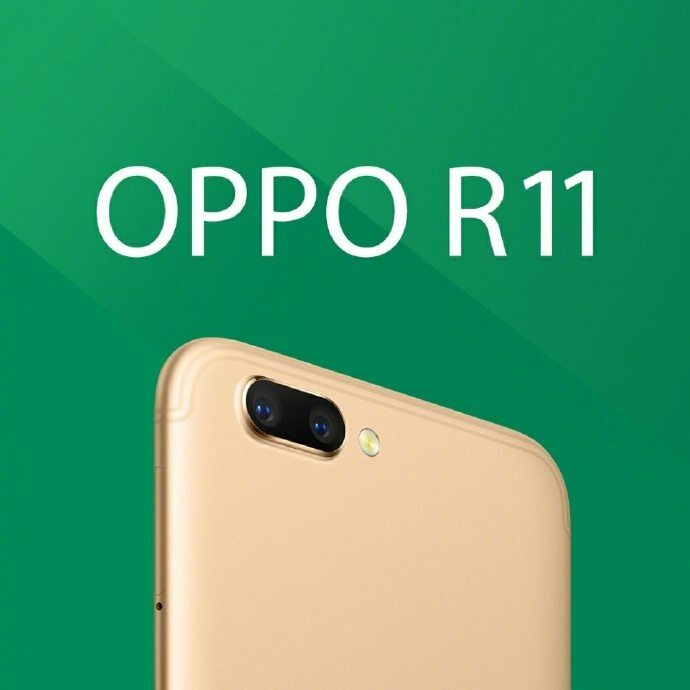 The company is now teasing the launch of its new smartphone Oppo R11 that will feature a dual rear camera with LED flash as per the teasers released by the company on the weibo account. The device has also made its appearance on the AnTuTu benchmark revealing some of its key specifications. 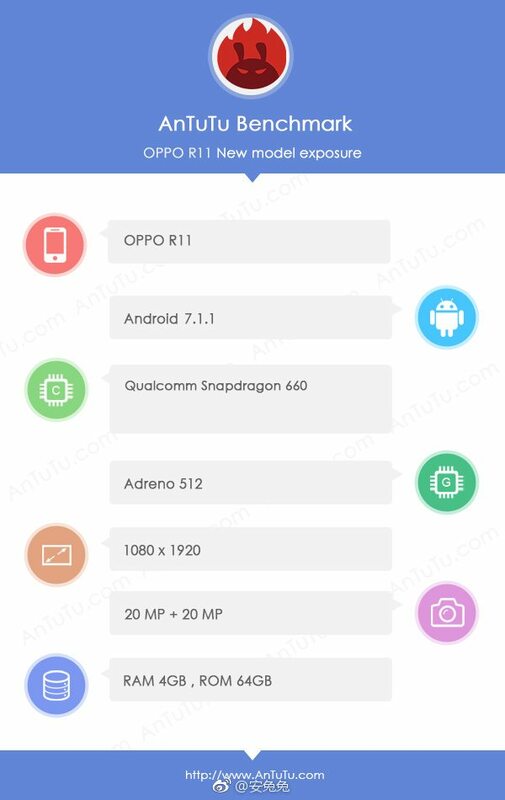 The AnTuTu listing confirms that the new Oppo R11 will be powered by the newly launched Qualcomm Snapdragon 660 processor. The dual rear camera in the official teaser looks similar to the iPhone 7 Plus dual camera design but iPhone 7 Plus dual camera comes with DSLR like camera features and technology that Oppo R11 might not give with its dual rear camera. At AnTuTu, the Oppo R11 is listed with a full-HD display with 1920 x 1080 pixels resolution and is powered by the Qualcomm Snapdragon 660 SoC that also comes with Adreno 512 GPU. It is listed with 4GB of RAM and 64GB of inbuilt storage capacity and might be having the expandable MicroSD card slot with up to 128GB storage capacity. The Oppo R11 runs on the latest Android 7.1.1 OS out of the box. The AnTuTu listing further confirms that it will feature a 20-megapixel front facing camera and will have a 20-megapixel rear camera as well with LED flash. If we check the teaser image of the device, it might be having a second camera on the rear side with 12-megapixel lens. We have to wait for the confirmation though. To recall the Oppo F3 Plus was launched with a 5.5-inch Full HD 2.5D curved glass display with Corning Gorilla Glass 5 protection and 1080 x 1920 pixels resolution, a 1.5 GHz octa-core MediaTek MT6750T 64-bit processor with Mali T860 GPU, 4GB of RAM, 64GB internal storage capacity, expandable storage up to 128GB with the help of microSD card, Android 6.0.1 (Marshmallow) OS with ColorOS 3.0, Dual-SIM option, a 13-megapixel rear camera with dual-tone LED Flash, a dual front facing camera with 16-megapixel lens having with 76.4-degree wide-angle lens, 1/3.1-inch sensor, f/2.0 aperture and and an 8-megapixel front camera with 120-degree wide-angle lens, a 3200mAh battery and supports 4G VoLTE, WiFi 802.11 a/b/g/n, Bluetooth 4.1, GPS connectivity options and a fingerprint sensor on the front facing physical home button. The Oppo F3 Plus was launched last month with a 6-inch Full HD 2.5D curved glass display with 1080 x 1920 pixels resolution and Corning Gorilla Glass 5 protection, octa-core Snapdragon 653 processor (Quad 1.95GHz ARM Cortex A72 + Quad 1.44GHz A53 CPUs) with Adreno 510 GPU, 4GB of RAM, 64GB internal storage capacity, expandable storage up to 256GB with microSD card, Android 6.0.1 (Marshmallow) OS with ColorOS 3.0, Hybrid Dual SIM slot, a 16-megapixel rear camera with f/1.7 aperture, 1/2.8″ Sony IMX398 sensor, Dual Focus PDAF, 6P lens, dual-tone LED Flash, OIS, 4K video recording, a dual selfie camera with a 16-megapixel lens having 76.4-degree wide-angle lens, 1/3.1-inch sensor, f/2.0 aperture and an 8-megapixel lens with 120-degree wide-angle lens, a 4000mAh battery with VOOC Flash Charge, 4G VoLTE, WiFi 802.11ac (dual-band), Bluetooth 4.1 and GPS connectivity options, a fingerprint sensor on the physical home button and it measures 163.63×80.8×7.35mm and weights 185 grams.